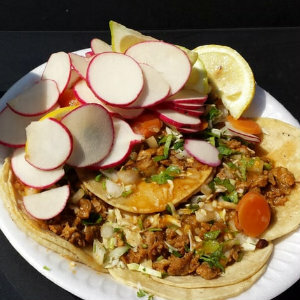 One of Orange County’s best-kept secrets is the El Chavito taco truck. Famous for their street tacos and great service, this place offers every type of meat you can imagine. Their tacos go for 60 cents each, but sell for 50 cents if you buy 30 or more. It’s a family owned business with the best service around, they even give you complimentary pineapple juice while you wait! There is always a line, but the food comes out fast and is worth the wait! It’s the best taco spot in Huntington Beach, with homemade sauces, pickled radishes and jalapenos. They also offer other Mexican foods such as tortas, quesadillas, and burritos. But their tacos are the reason they are known and loved. A true treat for taco lovers. You can find the truck by checking their Yelp page.